Borderlinx | Buy Gant and ship worldwide with Borderlinx. Cheap rates guaranteed. You've seen them in films: elegant people holding a martini while standing along the edges of the horseracing track, laughing cheerfully. You too can be effortlessly beautiful, timelessly chic. For just this purpose, Gant USA has been designing beautiful and classy American sportswear for well over 50 years. Gant USA styles are constantly varied, redesigned each and every season, but always keeping the elements of comfortable elegant chic that the brand has come to be known for. A tailored sports jacket for him, a lightweight and flowing summer dress for her, a button-up dress shirt for the little one, a luxury towel set for the home, the possibilities when it comes to Gant USA designs are endless. The spring/summer collection from Gant USA is promising, whether it be the light-colored linen jackets for him, the pastel knit cardigans for her, or even the lace-covered sleeveless dress for the little one. Regardless of the piece you choose from Gant USA, you can be sure that it will be of immaculate quality and innovative style. Aside from its main collection, Gant USA collections include GANT Rugger and GANT by Michael Bastian, which offer items like polo shirts, chinos, blazers and jeans. Prices vary, but there are many pieces available for around $100. 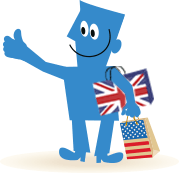 Buying GANT in the USA may be a dream of yours, but you fear that it won't come at cheap price and don't want the hassle of dealing with shipping, tax & duties. Well, worry no more! With Borderlinx and its handy Shipping cost calculator, your life is made much easier! A number of services are available through Borderlinx to make international ordering from GANT USA hassle-free, including concierge, free repacking and consolidationservices.